Six Harmonies or Liuhe Pagoda is a multi story structure, which is also known as Six Harmonies Pagoda located in the foot of Yuelun Hill in southern Hangzhou, Zhejiang Province, People's Republic of China.The Pagoda is magnificently overlooking the gracious Qiantang River.It was constructed during Northern Song Dynasty in AD 970.The Pagoda reflects the true ancient Chinese architectures.The Pagoda is built to calm down the tidal waters of Qiantang River and also to support the river navigation. The name 'Liuhe' represents the six Buddhist ordinances.The Pagoda was completed destroyed during a battle in 1121. The new pagoda was built by using bricks and woods during Southern Song Dynasty, reigned during 420 -589 and also additional exterior works and eaves were built during Ming and Qing Dynasties. The whole construction is octagonal shape.The pagoda is having 59.89 meters height and having 13 storeys in appearance from outside but actually it has only seven storeys. A spiral staircase is provided to reach to the top floor.Each of the floor ceilings are beautifully painted with animals, birds, various characters and flowers.Each floor has four elements that identical to each other and they are exterior walls, interior walls, small chamber and zigzagged corridor. When looking from outside, the upper portion of the pagoda looks brighter and on the lower side it seemed like bit darker. This is due to the wonderful combination of light and shade. As per renowned historian Joseph Needham, the pagoda was also used a lighthouse to navigate vessels passing through Qiantang River. 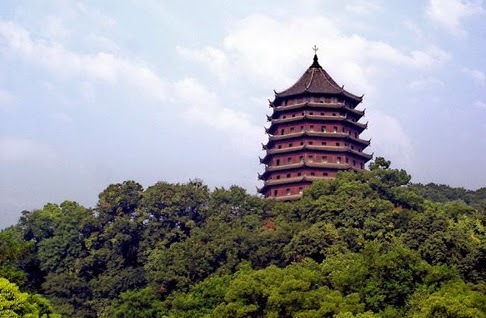 Due the considerable height of the structure, it has been used as permanent lighthouse during the early days itself.On climbing top of the pagoda and by standing on the majestic eaves, tourist can have the wonderful panoramic view of surrounding areas. Also, you can have spectacular view of the Qiantang River Bridge and the ripples of tidal waves. Near to the pagoda, a new exhibition center, Pagoda Park, is constructed and lot of ancient relics and exhibitions detailing the ancient pagodas build around Yuelun Hill in China. There is a beautiful legend about the reason for construction of this octagonal structure in the foot hill of Yuelun Hill. The pagoda was build to suppress the horrific tidal bore generated from Qiantang River. The river often suffered from the tidal bores that surge up from Hangzhou Bay. People beleived the Dragon King is responsible for this phenomenon. Hearing the plight of the people a local boy named Liuhe used his magical power to crease the Dragon King's nefarious actions.As a token of gratitude the local farmers constructed this fine structure with brick and wood and called after his name. The name "Six Harmonies" is taken out from the Six Buddhist ordinances, which are heaven, east, west, south, north and earth. From the city Hangzhou tourist can easily move the Six Harmonies Pagoda. Tourists can choose bus routes 2, 308, 5 and K4 which are regularly operating from the city terminal. Alternately, for group tourists can engage in tourist coaches.Taxi services are also available which are very economical.Tourist boarding from Shanghai, if travelling by High Speed Bullet train the journey would be much comfortable and easy. The pagoda will be opened 6:30 am to 5:30 pm.CNY 20 per head is the entrance fee. The body of the pagoda is adorned from bottom to top with 104 iron bells which are hanging from the graceful upswept eaves. Something really charming at Six Harmonies Pagoda!